So, at that time, the term for giving thanks, still (at least in this context), meant giving thanks. Now concerning the Thanksgiving (Eucharist), thus give thanks. First, concerning the cup: We thank you, our Father, for the holy vine of David Your servant, which You made known to us through Jesus Your Servant; to You be the glory forever. And concerning the broken bread: We thank You, our Father, for the life and knowledge which You made known to us through Jesus Your Servant; to You be the glory forever. Even as this broken bread was scattered over the hills, and was gathered together and became one, so let Your Church be gathered together from the ends of the earth into Your kingdom; for Yours is the glory and the power through Jesus Christ forever. But let no one eat or drink of your Thanksgiving (Eucharist), but they who have been baptized into the name of the Lord; for concerning this also the Lord has said, Give not that which is holy to the dogs. So, this clearly is referring to a ceremony related to Jesus' last Passover. It uses forms of the Greek word eucharist four times, with the first one referring to a ceremony. And it is clearly referring to breaking the bread. 13:1 Take heed, then, often to come together to give thanks to God, and show forth His praise. (Letter to the Ephesians 13:1). 4:1 Take heed, then, to have but one Eucharist. For there is one flesh of our Lord Jesus Christ, and one cup to [show forth ] the unity of His blood; one altar; as there is one bishop, along with the presbytery and deacons, my fellow-servants: that so, whatsoever you do, you may do it according to [the will of] God. (Letter to the Philadelphians 4:1). 8:1 See that ye all follow the bishop, even as Jesus Christ does the Father, and the presbytery as ye would the apostles; and reverence the deacons, as being the institution of God. Let no man do anything connected with the Church without the bishop. Let that be deemed a proper Eucharist, which is[administered] either by the bishop, or by one to whom he has entrusted it. (Letter to the Smyrnaeans 8:1 Roberts). 8:1 But avoid divisions, as being the beginning of evils. Do ye all follow the bishop, as Jesus Christ doth the Father; and follow the presbyters as the apostles; and have respect unto the deacons as unto the commandment of God. Let no one, apart from the bishop, do any of the things that appertain unto the church. Let that eucharist alone be considered valid which is celebrated in the presence of the bishop, or of him to whom he shall have entrusted it. (Letter to the Smyrnaeans 8:1 Hoole). The first citation is giving thanks, whereas those in the letters to the Philadelphians and Smyrnaeans sounds like the Passover ceremony. Both of those latter letters are consistent with a ceremony that was annually, as opposed to weekly or daily. Now, there is some controversy related to the citation that follows related to Ignatius' Letter to the Smyraneans 7:1. Essentially, Roberts and Donaldson use a Greek source that uses the term eucharist, whereas three other sources I have checked do not. It is believed by various scholars that the original Letter did not have the eucharistic statement in 7:1. Scholars have agreed that parts of Ignatius' writings were tampered with (Holmes M. The Apostolic Fathers. 2004, pp. 131-132). 20:2 obey the bishop and the presbytery with an undivided mind, breaking one and the same bread, which is the medicine of immortality, and the antidote to prevent us from dying, but [which causes] that we should live for ever in Jesus Christ. And, in the Continuing Church of God, we still break bread as part of the Passover ceremony. In the second century, there were changes as to when those who kept with apostolic practices and those who held to other traditions. One was the date of Passover (some switched to Sunday; see also Passover and the Early Church), whereas another had to do with the Passover/Eucharist ceremony. For, in the name of God, the Father and Lord of the universe, and of our Saviour Jesus Christ, and of the Holy Spirit, they then receive the washing with water ... And this washing is called illumination, because they who learn these things are illuminated in their understandings (First Apology 61). And this food is called among us Εύχαριστία [the Eucharist], of which no one is allowed to partake but the man who believes that the things which we teach are true, and who has been washed with the washing that is for the remission of sins, and unto regeneration, and who is so living as Christ has enjoined. For not as common bread and common drink do we receive these; but in like manner as Jesus Christ our Saviour, having been made flesh by the Word of God, had both flesh and blood for our salvation, so likewise have we been taught that the food which is blessed by the prayer of His word, and from which our blood and flesh by transmutation are nourished ... Which the wicked devils have imitated in the mysteries of Mithras, commanding the same thing to be done. For, that bread and a cup of water are placed with certain incantations in the mystic rites of one who is being initiated, you either know or can learn (First Apology 66). Then we all rise together and pray, and, as we before said, when our prayer is ended, bread and wine and water are brought, and the president in like manner offers prayers and thanksgivings, according to his ability, and the people assent, saying Amen; and there is a distribution to each, and a participation of that over which thanks have been given, and to those who are absent a portion is sent by the deacons. And they who are well to do, and willing, give what each thinks fit; and what is collected is deposited with the president, who succours the orphans and widows and those who, through sickness or any other cause, are in want, and those who are in bonds and the strangers sojourning among us, and in a word takes care of all who are in need. But Sunday is the day on which we all hold our common assembly (First Apology 67). So, this was not only a change in date and practice, but it seems also to be a change in frequency. One of the earliest descriptions of the Eucharist, that by Justin Martyr, not far from the middle of the second century, recognizes the similarity to what was seen in one the mystery cults, Mithraism ... it has been repeatedly asserted that in baptism and the Eucharist Christians borrowed from the mysteries and that Christianity was simply another one of these cults ...The similarity is striking (Latourette KS. A History of Christianity, Volume 1: to A.D. 1500. HarperCollins, San Francisco, 1975, p. 198). Of course, true Christianity could not "borrow" from the sun-cults, but Justin and those that follow his examples apparently have. It should be understood that while Justin calls the newly baptized "illuminated" the Bible does not. FOR more than three centuries Mithraism was practised in the remotest provinces of the Roman empire and under the most diverse conditions ... the promise of complete illumination, long withheld, fed the ardor of faith with the fascinating allurements of mystery ... The gods were everywhere, and they mingled in every act of life; the fire that cooked the food and warmed the bodies of the faithful, the water that allayed their thirst and cleansed their persons, the very air that they breathed, and the light that illuminated their paths, were the objects of their adoration. Perhaps no other religion ever offered to its sectaries in a higher degree than Mithraism opportunities for prayer and motives for veneration (Cumont, Franz. Translated from the second revised French edition by Thomas J. McCormack. The Mysteries of Mithra. Chicago, Open Court  pp. 104,120,149). I suspect that some who had some connection with Mithraism professed Christ and that those ceremonies got picked up by apostates who Justin apparently distantly came into contact with. And even though Justin is attempting to state that Mithraism copied "Christian" ceremonies, the fact is that the Mithra ceremonies, including Sunday worship, were in existence prior to Jesus coming. Jesus, of course, kept Saturday for the Sabbath. Hence it would appear that those who practiced Sunday, called baptized persons "illuminated" (a term indicating "light", such as sunlight) and the mystic eucharistic ceremonies were following non-Christian influences as it obviously did not happen the other way around with these practices. For more details, please see the article Do You Practice Mithraism? Marcus... leading Gnostics. ... The founder of the Marcosians and elder contemporary of St. Irenæus, ... Marcus first taught in Asia Minor and possibly later in the West also. His immoralities and juggling tricks (colouring the contents of the cup and increasing the quantity) are described by Irenæus and Hippolytus.. (Arendzen JP. Transcribed by Joseph P. Thomas. Marcus. The Catholic Encyclopedia, Volume IX. Published 1910. New York: Robert Appleton Company. Nihil Obstat, October 1, 1910. Remy Lafort, Censor. Imprimatur. +John M. Farley, Archbishop of New York). Even though Roman Catholics consider that Marcus was an immoral Gnostic heretic, he may have come up with a version of the Catholic eucharistic ceremony, and since he had other Mithratic practices, he apparently utilized them as well. 1. But there is another among these heretics, Marcus by name, who boasts himself as having improved upon his master. He is a perfect adept in magical impostures, and by this means drawing away a great number of men, and not a few women, he has induced them to join themselves to him, as to one who is possessed of the greatest knowledge and perfection, and who has received the highest power from the invisible and ineffable regions above. Thus it appears as if he really were the precursor of Antichrist. For, joining the buffooneries of Anaxilaus to the craftiness of the magi, as they are called, he is regarded by his senseless and cracked-brain followers as working miracles by these means. 2. Pretending to consecrate cups mixed with wine, and protracting to great length the word of invocation, he contrives to give them a purple and reddish colour, so that Charis, who is one of those that are superior to all things, should be thought to drop her own blood into that cup through means of his invocation, and that thus those who are present should be led to rejoice to taste of that cup, in order that, by so doing, the Charis, who is set forth by this magician, may also flow into them. Again, handing mixed cups to the women, he bids them consecrate these in his presence. When this has been done, he himself produces another cup of much larger size than that which the deluded woman has consecrated,) and pouting from the smaller one consecrated by the woman into that which has been brought forward by himself, he at the same time pronounces these words: "May that Chaffs who is before all things, and who transcends all knowledge and speech, fill thine inner man, and multiply in thee her own knowledge, by sowing the grain of mustard seed in thee as in good soil." Repeating certain other like words, and thus goading on the wretched woman [to madness], he then appears a worker of wonders when the large cup is seen to have been filled out of the small one, so as even to overflow by what has been obtained from it. By accomplishing several other similar things, he has completely deceived many, and drawn them away after him. 3. It appears probable enough that this man possesses a demon as his familiar spirit, by means of whom he seems able to prophesy, and also enables as many as he counts worthy to be partakers of his Charis themselves to prophesy (Book 1, Chapter 13, Verses 1-3). It is of interest to note that the Roman Catholics now claim that Mary is in the eucharist, and Marcus may have been the first to associate a woman with a similar ceremony. It is also of interest to note that this particular Marcus was a religious heretic with mystic practices. Irenaeus correctly indicates, that he seems to have similarities to the one who would be the final Antichrist. And on this point Irenaeus is correct (Irenaeus seems to get confused in some of his later writings on Antichrist though). 14 Therefore, my beloved, flee from idolatry. 15 I speak as to wise men; judge for yourselves what I say. 16 The cup of blessing which we bless, is it not the communion of the blood of Christ? The bread which we break, is it not the communion of the body of Christ? 17 For we, though many, are one bread and one body; for we all partake of that one bread. Changing the Passover to a different "Eucharist" would seem to be partaking of the table of demons. This is something that Marcus and others have done. The Church of Rome adopted changes in its Eucharist. By “Supper of the Lord,” Priest Bagatti essentially means the New Testament Passover—which is only an annual event. By the devil, of course, to whom pertain those wiles which pervert the truth, and who, by the mystic rites of his idols, vies even with the essential portions of the sacraments of God…Mithra there, (in the kingdom of Satan,) sets his marks on the foreheads of his soldiers; celebrates also the oblation of bread, and introduces an image of a resurrection, and before a sword wreathes a crown…is it not clear to us that the devil imitated the well-known moroseness of the Jewish law? Since, therefore he has shown such emulation in his great aim of expressing, in the concerns of his idolatry, those very things of which consists the administration of Christ's sacraments, it follows, of course, that the same being, possessing still the same genius, both set his heart upon, and succeeded in, adapting to his profane and rival creed the very documents of divine things and of the Christian saints—his interpretation from their interpretations, his words from their words, his parables from their parables (Tertullian. The Prescription against Heretics, Chapter 40. Translated by Peter Holmes, D.D., F.R.A.S.). Thus, in North Africa it was acknowledged that sacramental practices that the Greco-Roman alliance were adopting were similar to those of Mithraism--which may have originally influenced Marcus. And while Tertullian hints that the devil caused Mithra followers to have some similar practices that his church had, it is most likely that these practices had been adopted by some who professed Christ that were influenced by followers of Mithra. The view most widely held today among upholders of the historico-religious theory is that the Eucharist and the Mass originated in the practices of the Persian Mithraism (Dieterich, H. T. Holtzmann, Pfleiderer, Robertson, etc.). "In the Mandaean mass" writes Cumont ("Mysterien des Mithra", Leipzig, 1903, p.118), "the celebrant consecrated bread and water, which he mixed with perfumed Haoma-juice, and ate this food while performing the functions of divine service". Tertullian in anger ascribed this mimicking of Christian rites to the "devil" and observed in astonishment (De prescript haeret, C. xl): "celebrat (Mithras) et panis oblationem." (Pohle. J. Transcribed by Joseph P. Thomas. Sacrifice of the Mass. The Catholic Encyclopedia, Volume X. Published 1911. New York: Robert Appleton Company. Nihil Obstat, October 1, 1911. Remy Lafort, S.T.D., Censor. Imprimatur. +John Cardinal Farley, Archbishop of New York). There were seven degrees of initiation into the mithraic mysteries...The fathers conducted the worship. The chief of the fathers, a sort of pope, who always lived at Rome, was called "Pater Patrum" or Pater Patratus." The members below the degree of pater called one another "brother," and social distinctions were forgotten in Mithraic unity...A sacred meal was celebrated of bread and haoma juice for which in the West wine was substituted. This meal was supposed to give the participants super-natural virtue...Mithraism had a Eucharist, but the idea of a sacred banquet is as old as the human race and existed at all ages and amongst all peoples (Arendzen. J.P. Transcribed by John Looby. Mithraism. The Catholic Encyclopedia, Volume X. Published 1911. New York: Robert Appleton Company. Nihil Obstat, October 1, 1911. Remy Lafort, S.T.D., Censor. Imprimatur. +John Cardinal Farley, Archbishop of New York). It is of interest to note that Mithraism had some type of Roman pope, had "fathers" conduct their worship services, and conducted a eucharist ceremony like the Roman Catholics still do. Since Irenaeus originally condemned Marcus' bread and wine ceremony, and Tertullian noted that there was a similarity between the Mithra ceremony and the one he observed, it seems that Mithraism influenced Marcus and that somehow this may have influenced the Roman Church to adopt practices that one of its saints (Irenaeus) condemned. They maintain, then, that first of all the four elements, fire, water, earth, and air, were produced after the image of the primary Tetrad above, and that then, we add their operations, viz., heat, cold, dryness, and humidity, an exact likeness of the Ogdoad is presented. They next reckon up ten powers in the following manner:— There are seven globular bodies, which they also call heavens; then that globular body which contains these, which also they name the eighth heaven ; and, in addition to these, the sun and moon. These, being ten in number, they declare to be types of the invisible Decad , which proceeded from Logos and Zoe . As to the Duodecad , it is indicated by the zodiacal circle, as it is called; for they affirm that the twelve signs do most manifestly shadow forth the Duodecad , the daughter of Anthropos and Ecclesia...The sun also, who runs through his orbit in twelve months, and then returns to the same point in the circle... Also the circumference of the zodiacal circle itself contains three hundred and sixty degrees (for each of its signs comprises thirty); and thus also they affirm, that by means of this circle an image is preserved of that connection which exists between the twelve and the thirty. Still further, asserting that the earth is divided into twelve zones, and that in each zone it receives power from the heavens, according to the perpendicular [position of the sun above it], bringing forth productions corresponding to that power which sends down its influence upon it, they maintain that this is a most evident type of the Duodecad and its offspring. (Irenaeus. Adversus Haereses, Book I, Chapter 17, Verse 1) . 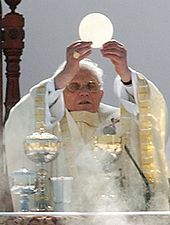 The eucharistic host resembles a circle: it is likely an astrological symbol (The Bible and Astrology) or a sun-deity symbol. As far as the 'ogdoad' goes, this led to the veneration of the 'eighth day' of the week, and now Sunday is considered to be the 'eighth day' by Catholics and Protestants, despite the fact that Marcus and his followers were clearly Gnostic heretics (read Sunday and Christianity and/or watch Sunday: First and Eighth Day?). A LONG section in Irenæus is our almost exclusive source for a knowledge of Marcus and his followers. Hippolytus and Epiphanius simply copy Irenæus and add nothing but new terms of condemnation, while our information from other sources is a question of lines and not of paragraphs. The unreliability of Irenæus as a chronicler of Gnostic views is already known to our readers, and in the case of Marcus and the Marcosians is more painfully patent than usual. It seems that some of the adherents of the school were to be found even among the rude populace of the Rhone valley, and the worthy Presbyter of Lyons was especially anxious to discount their influence. He begins the attack by retailing all the scandalous stories he can collect about Marcus, a man he had never seen, and who had not been nearer to the sheepfold of Lyons than Asia Minor, or at best Egypt! (Mead, G.R.S. Fragments of a Faith Forgotten. Theosophical Publishing Society: London  p. 359 http://www.sacred-texts.com/gno/fff/fff54.htm viewed 12/09/07). That being said, the Marcosians certainly put out something that was not biblical that many ended up at least partially adopting. Of course, not all went along with these eucharistic changes. The KEY OF TRUTH teaches that after Adam and Eve sinned and their children, they became slaves of Satan until the advent of the newly created Adam, Jesus Christ. "Except Gregory Magistros, none of the Armenian sources lays stress on the dualism of the Paulicians!" Number 2. They blasphemed the virgin, allegorizing her as the upper Jerusalem, in which the Lord came in and went out, and denying that He was really made flesh of her. John IV records that in the orthodox Armenian church of the 7th century, many held Christ to have been made flesh in but not of the virgin; and Armenian hymns call the virgin mother church at once Theotokos and heavenly Jerusalem. It is practically certain that Paulicians held this view. They allegorized the eucharist and explained away the bread and wine. They denied that we ought to offer bread and wine as a sacrifice. It is just symbolical. It is not offered as a sacrifice and it is not transferred into the literal Christ, either. Such allegorization meets us already in Origen, Eusebius and other early fathers, and is quite compatible with that use of a material eucharist, which Nerses II attests among the Paulicians of the early 6th century, and for which the KEY OF TRUTH provides a form. So, they considered it merely an allegory...the Passover...that it was symbolical, it was a material eucharist, literal material wine and bread, and that is all, and that it just reminded us of something. It was not a sacrifice, but reminded us of something. This man attests that it was held among the Paulicians of the early 6th century, which would put it in the 500's A.D. This is the most accurate account of the Paulicians, because it was written by Paulicians and God caused it to be lost in history until 1828 when it was uncovered in Armenian Russia. The Thronraki, according to Gregory Magistros, hold that "Jesus in the evening meal, spoke not of an offering of the mass, but of every table." We infer that the Paulicians merely rejected the Eucharistic rites and doctrines of the Greeks. According to Gregory Magistros the Thronraki would say: "We are no worshippers of matter, but of God; we reckon the cross and the church and the priestly robes and the sacrifice of mass all for nothing, and only lay stress on the inner sense." In the Church of God we do not consider that the Passover/Eucharist is an actual sacrifice, but is essentially a reminder of the sacrifice of Christ. The Mass and the Eucharist are rejected because Jesus Christ gave his flesh and blood but once to His disciples, and repetition is impossible. So, the old WCG and the Petrobrusians did, per se, reject the eucharist, but the way the Church of Rome expects people to accept. So, while we normally use the term eucharist in the 21st century in the Continuing Church of God, it was a term that has been sometimes used over the centuries. Catholics must attend the weekly sacrifice of the Eucharist in order for the sins committed during the previous week to be forgiven. According to the Catechism, “The Eucharist is a sacrifice because it re-presents the sacrifice of the cross…the sacrifice of Christ and the sacrifice of the Eucharist are one single sacrifice: The victim is one and the same. In this divine sacrifice…the same Christ who offered himself once in a bloody manner on the altar of the cross is contained and is offered in an unbloody manner…this sacrifice is truly propitiatory” (CCC para. 1366,1367). In other words, Catholics are taught that divine justice (for their sins) is satisfied every time the Eucharist is offered to God. Catholics are also taught that their redemption comes through the ongoing sacrifice of the Eucharist. “Every time this mystery is celebrated, the work of our redemption is carried on” (CCC, para. 1405). This blatantly denies the testimony of Scripture. When Jesus…”entered the holy place once for all, having obtained eternal redemption” (Heb. 9:12). Catholics are given no choice but to believe these deceptive teachings. If they deny the physical presence of Jesus in the Eucharist, they are condemned by their religion. “If anyone denies, that in the sacrament of the most Holy Eucharist, are contained truly, really and substantially the body and blood together with the soul and divinity of our Lord Jesus Christ, and consequently the whole Christ…let him be anathema” (Canon 1, Council of Trent). Mike Gendron is a former Roman Catholic. Let me add that yes, the Bible is clear that Jesus only needed to be sacrificed once. While Protestants do not always use the round eucharist host, many Protestants are working with the Church of Rome and promoting Pope Francis and his interfaith/ecumenical agenda. The ecumenical and interfaith movements are not Christian. It is warned about in the Bible (Revelation 17-18). It is only after Babylon falls (Zechariah 2:6-7) and Jesus returns that true Christian unity will occur (Zechariah 2:10-11). The Bible warns that God’s people are NOT to be part of the movement that exists before Jesus returns (Revelation 18:4; watch also Do You Know That Babylon is Forming?). But is there another way for those interested in the truth to be able to determine if the eucharistic host now used is from the Bible or not? A careful comparison of what is taught in the Bible and the Catechism of the Catholic Church along with eucharistic practices should make this clear to any truly interested in the truth. The Apostle Paul is teaching that Christians are to follow or imitate him as he imitates Christ (the Greek word translated as follow/imitate above is mimetes; the English word mimic comes from it). Thus, all should be careful to carefully follow Jesus and the Apostle Paul in this regard. Article 3, under the Seven Sacraments of the Church in the Catechism of the Catholic Church discusses the eucharist. Section II asks and answers the question, What is this Sacrament Called? Several names are listed, including "The Breaking of Bread" (#1329). 19 And the disciples did as Jesus appointed to them, and they prepared the pasch. Notice, it is very clear that Jesus BROKE the bread on Passover (Pasch means Passover). 16 The chalice of benediction, which we bless, is it not the communion of the blood of Christ ? And the bread, which we break, is it not the partaking of the body of the Lord? (1 Corinthians 10:16, Douay-Rheims). 23 For I have received of the Lord that which also I delivered unto you, that the Lord Jesus, the same night in which he was betrayed, took bread. Thus, to have a Passover/eucharistic ceremony where they bread is not broken is certainly not imitating Jesus, the Apostle Paul, nor the early Christians. It is a change that the Church of Rome must have gotten outside of the Bible. Yet, in the eucharistic ceremonies in the Catholic Church, the bread is not broken. Instead, it is a round host that the Catechism of the Catholic Church says can/should be worshipped and adored (CCC #1378, p. 385). Yet, there is no indication that the early Christians or the apostles did anything like that. They only taught that it was to be eaten. Worshippers of sun-gods worshipped round symbols. Early Christians did not. The word "host" (or derivatives) do not appear to be a direct translation of any of the original Hebrew or Greek that the Bible was actually written in. Hence, it does not seem to be a biblical term, but instead may have pagan ties according to certain Catholic researchers. Latin Mass...The truth is -- in English, Italian, and Spanish, among others -- the vernacular translations of the consecration of the wine makes it of doubtful validity...as has been demonstrated by Father Paul Kramer in his book The Suicide of Altering the Faith in Liturgy (Gruner N. Is Antichrist Coming Next? The Fatima Crusader, 96, Autumn 2010, p. 10). Now, in case everyone is unaware of this, it should be pointed out that the original apostles spoke Greek (cf. Acts 21:37-39) and other languages, but there is no indication that any of them used Latin in any early Christian ceremony (and even if they did, it certainly was not a widespread, or universal, practice). Even Tertullian, the so-called "father of Latin theology" did not begin to write until around 190 A.D. Latin mass is a CHANGE. Those who are true traditionalists would realize that the Passover services was not done in Latin and there is no valid reason to insist on Latin today. Those who insist on Latin and those who use a round host are absolutely altering the liturgy of the faith of the original Christians. Cannot those who claim to be Catholic traditionalists see this? The altar or communion-table thus provisioned was the coffin lid. This also was continued in the ritual of Rome, for it is a fact that the earliest Christian altar was a coffin. According to Blunt's Dictionary of Doctrinal and Historical Theology (p. 16), this was a hollow chest, on the lid or mensa of which the eucharist was celebrated. This, as Egyptian, was the coffin of Osiris that constituted the altar on which the provisions were laid in Sekhem for the eucharistic meal. Hence the resurrection is described as "dawn upon the coffin of Osiris." Therefore he rose in spirit from the mummy in the coffin, beneath the lid which constituted the table. This was the body supposed to be eaten as the eucharist, which was represented by the provisions that were laid upon the altar for the sacramental meal...The first of the Osirian mysteries is the primary Christian sacrament. "Provisioning the altar " was continued by the Church of Rome. "The mysteries laid upon the altar" which preceded " the communion of the body and blood of Christ " were then eaten in the eucharistic meal (Neale, Rev. J. M., The Liturgies, Introd., p. 33). Thus we see in the camera obscura that the provisions laid on the altar or table represented the flesh and blood of the victim about to be eaten sacramentally. The night of the things that were laid upon the altar is the night of the great sacrifice, with Osiris as the victim. The things laid on the altar for the evening meal represented the body and blood of the Lord. These, as the bread and wine, or flesh and beer, were transelementecl or transubstantiated by the descent of Ra the holy spirit, which quickened and transformed the mummy Osiris into the risen sahu, the unleavened bread into the leavened, the water into wine. Osiris, the sacrifice, was the giver of himself as "the food which never perishes" (Rit, ch. 89). Of course, average Catholics have no idea their beloved Eucharist is nothing more than an updated version of an ancient Babylonian occult practice. When this religion spread to Egypt, the Egyptians worshipped the sun god, Osiris, and the priests claimed "to have magical powers which enabled [the priests] to change the great Sun God, Osiris, into a wafer." Because the Eucharist is based upon the ancient worship of the sun, the host is made into the shape of a circle—the shape of the sun...Alberto warns that Catholics are also unaware that the initials on their hosts, IHS, really stand for the Egyptian gods Isis, Hoeb, and Seb. This was the origin of the Catholic practice of the Eucharist, the central act of worship in Roman Catholicism. ..
Now, some of the above seems to be his former belief and speculative (and understand that not all who were called Waldneses or Anabaptists were true Christians). Yet it is clear that the round host most certainly did not come from the Bible nor the earliest faithful Christians. 29 When the Lord thy God shall have destroyed before thy face the nations, which then shalt go in to possess, and when thou shalt possess them, and dwell in their land: 30 Beware lest thou imitate them, after they are destroyed at thy coming in, and lest thou seek after their ceremonies, saying: As these nations have worshipped their gods, so will I also worship. 31 Thou shalt not do in like manner to the Lord thy God. For they have done to their gods all the abominations which the Lord abhorreth (Deuteronomy 12:29-31, Douay-Rheims). So, God does not want altars like the pagans had to be used to worship Him. Nor does He want their practices continued. And while some have argued that God allowed the pagans to have practices that they did so that they could later accept Christ, the reality is that the early Christians did not have a round eucharistic host that was consecrated over an altar. There is no justification in scripture nor in the earliest traditions of the Christian church for getting away from the practices of Jesus and Paul in this area. The familiar monogram I H S was first popularized by St. Bernardine of Siena in the early fifteenth century (Hassett, Maurice. "Monogram of Christ." The Catholic Encyclopedia. Vol. 10. Nihil Obstat. October 1, 1911. Remy Lafort, S.T.D., Censor. Imprimatur. +John Cardinal Farley, Archbishop of New York. Robert Appleton Company, 1911. 28 Feb. 2011 <http://www.newadvent.org/cathen/10488a.htm>). Notice that the IHS and the use of the sun as a symbols were innovations and that the promoter was properly condemned as a heretic when he initially promoted them. Innovations like that were NOT part of the earliest tradition of the Christian church and have pagan elements. So, the Catholics are not truly clear where IHS came from, they suggest that IHS appeared in Catholicism no early than the fourth century, and that for centuries their church did not know the meaning of the abbreviation, it did not become popular until much later, and the one who popularized was denounced as a heretic promoting idolatry. This, of course, is not proof that IHS did or did not come from Egypt. Yet, the lack of knowing where IHS came from supports the overwhelming possibility that it might have come from outside of Christianity. The term eucharist originally meant giving thanks. In time, probably because Jesus used the expression and so did the Apostle Paul, related to Jesus' last Passover, it started to be used as a name for the Christian Passover service by some. The practices of the eucharist that many now practice are not consistent with the practices of the early Christians. Instead, they are closer to the practices of sun-god worshippers. Early Christians followed the examples of Jesus and the Apostle Paul and broke bread--they did not have a round "host." Throughout history, various ones have denied that Roman Catholic priests can transform bread into the actual flesh of Christ. It may be of interest to note that Mithras was the sun-god and his birthday was December 25th (more information is included in the article What Does the Catholic Church Teach About Christmas and the Holy Days?). While Jesus has a presence in Passover, it is not a repeat of His sacrifice. Because of the widespread confusion using the term 'eucharist,' as well the historical use of the term 'Passover,' in the Continuing Church of God, we normally use the expression Passover to refer to what Christians do annually in remembrance of Jesus' sacrifice.